Many customers find their energy bill incredibly confusing. Energy bills were voted even more confusing than loans or mortgages. That’s why Ofgem, the energy industry regulator, has tried to make it as easy as possible to understand your bills. This guide by EnergySeek will tell you everything you need to know about your Eon bill, including a breakdown of the pages and jargon it might contain. Let’s take a closer look at your Eon bill to learn more. 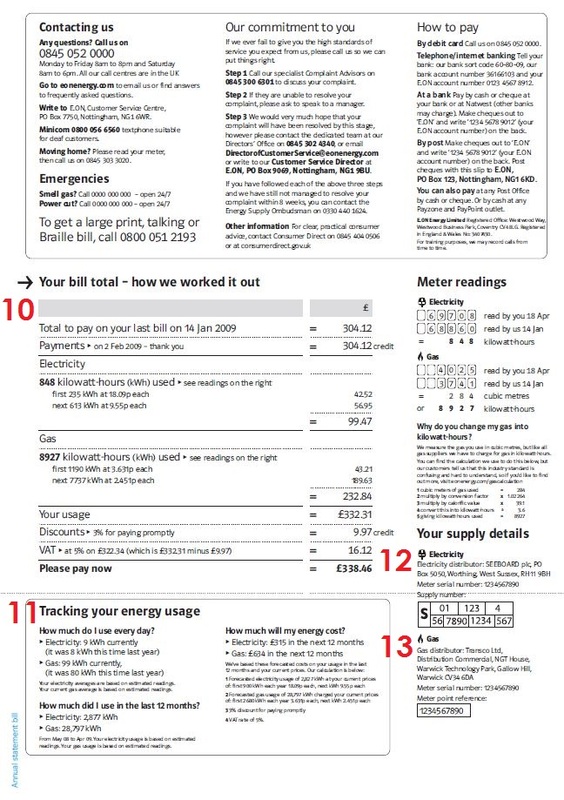 The first page of your bill contains most of the essential information about your Eon bill; how much it will be, any discounts you are receiving, and how they came to this number (meter readings for instance). It also includes information that you may not need every month, but it is beneficial to have. This includes things such as your account number which is important when speaking to your supplier, who your supplier is in case you forget, and contact details. Something else that should be considered is your tariff information. You can see this next to where your Eon bill information is and can tell you when your current contract is going to end and any exit fees. Sometimes, energy suppliers will roll you over onto their standard variable tariff which is usually not only more expensive, but the prices can change erratically with the open market. If you see that you are on your energy suppliers variable or ‘default’ tariff when you look at your Eon bill, you should consider switching immediately. Many customers state that they aren’t sure who their energy supplier is, as usual, your energy should be something that you only need to worry about when something has gone wrong. However, should that scenario occur you need to make sure you have the right information to be able to get in touch with their customer service as soon as possible? 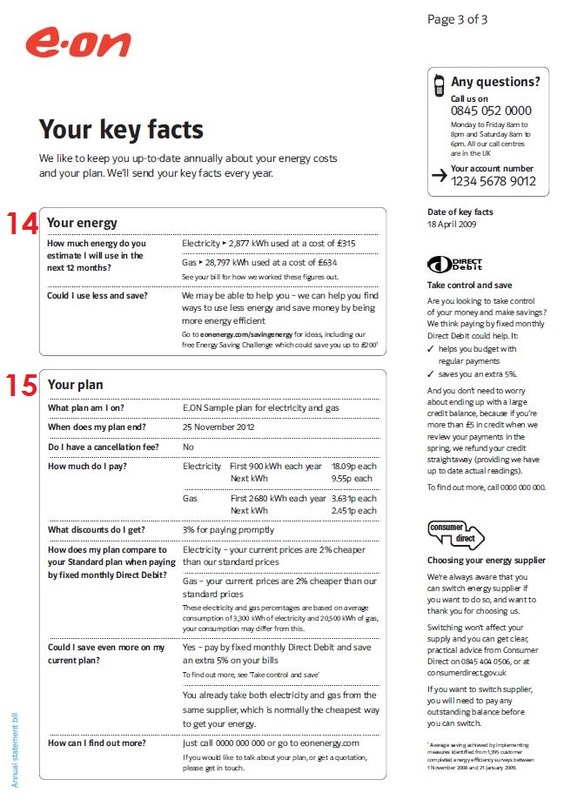 The top of the next page of your Eon bill usually contains information that concerns how you contact your energy supplier should you encounter any problems. Below that, you’ll find out how your energy supplier worked out your bill. This will include the amount of kWh of energy you used for both your electricity and gas, with a dedicated section about tracking your energy usage in the last 12 months. You can find your meter readings both by yourself and your energy company, which you can use as a reference in the future if you feel that you have been over or underbilled. Lastly, you can find your MPAN and MRPN numbers on your Eon bill. 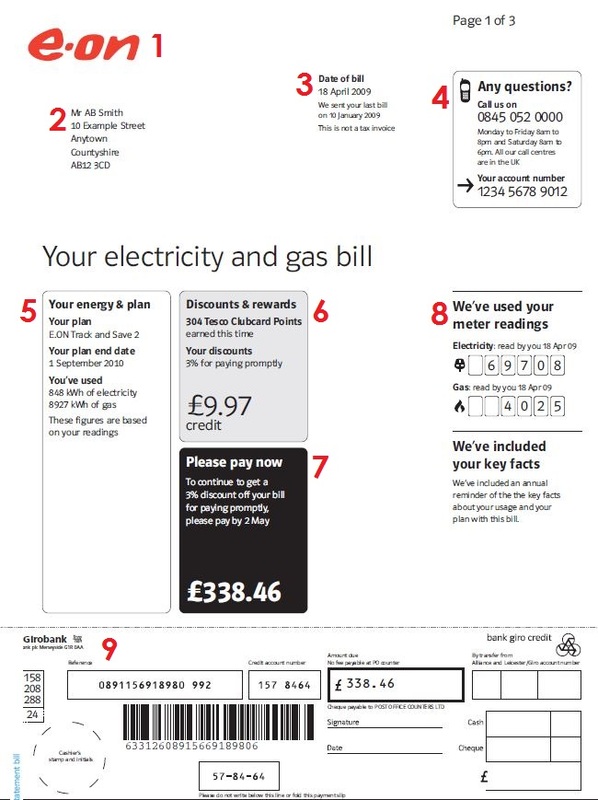 The last page of your Eon bill is two main sections. This section is concerning your power. It’s a personal projection to see what they expect your bill to look like in the next 12 months, assuming your energy consumption remains mostly the same. That can help with comparing energy suppliers for a better deal, as you can use this figure to see how much you could be saved elsewhere. This is where you can find more detailed information about your current energy plan. Not only can you see your tariff name, the date it ends and whether you have any cancellation fees, but it can also tell you how you can save more on your energy. For instance, you can sometimes get discounts for paying by fixed monthly direct debit or for having a dual fuel tariff. Are you an EON customer?